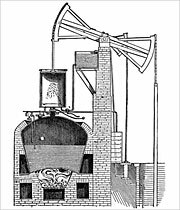 The completion of a successfully pumping, stationary steam engine in 1712, for the Coneygree Park colliery in Staffordshire, established Newcomen as the leading steam engine maker. Nothing comparable was available. As L.T.C. Rolt wrote in 1963, in Thomas Newcomen: The Prehistory of the Steam Engine, "Seldom in the history of technology has so momentous an invention been developed by one man so rapidly to so definitive a form". Newcomen's engines were now in demand around Britain. About 30 were constructed in the 1710s, mostly with cast brass cylinders of 330-710mm diameters. Brass was used rather than iron because of its lower melting temperature and because it is more easily worked, which was an important factor at a time when castings had to be finished by hand. Casting iron of a consistent quality was a technique still in its infancy — Abraham Darby's (1678-1717) groundbreaking work at Coalbrookdale had only begun in 1709. Three engines were built in 1714-15, starting with one at Griff colliery near Nuneaton, which was the second engine that Newcomen worked on personally. He also erected an engine at Woods Mine near Hawarden in Flintshire, north Wales, that cost almost £1,000 to construct. Meanwhile, his engine-building partner John Calley was erecting an engine at Moor Hall colliery near Austhorpe in Leeds, close to the family estate of future pioneering civil engineer John Smeaton (1724-92). Following Thomas Savery's death in May 1715, the rights to his 1698 patent for 'fire engines' were taken over by a joint stock company called the Proprietors of the Invention for Raising Water by Fire. So Newcomen's engines continued to be covered by the patent, which was not due to expire until 1733, and engine owners were obliged to keep paying a premium for their use. Though Newcomen's name does not appear on the committee of the Proprietors, who were probably the company's financiers, he was in effect its chief engineer. In 1716 the Proprietors agreed that he should have 20 of the company's 80 shares. Committee members included Newcomen’s friends Edward Wallin (c.1679-1733) and Ezekiel Trengove, who may have been a distant relative. The others were Edward Elliott (d.1717), John Meres (d.c.1726) who was succeeded by Cornelius Dutch (1693-1756), Thomas Beake (d.1733), William Perkins (d.1741) and Henry Robinson (d.1762). In general, mines were going deeper and it was found that horse gins (horse-powered pumps) couldn't drain them. When the first pit exceeded 150m deep, at Whitehaven collieries in Cumbria, the only effective solution was to use an atmospheric steam engine. Newcomen signed an agreement with colliery owner James Lowther (1673-1755) on 10th November 1715, and Calley was responsible for the engine's erection. It was operational by April 1717. Newcomen was in Cornwall for all of 1718, and probably most of 1719, during which time his wife Hannah looked after his affairs in Devon. Such a long period away from home implies he was working on at least one engine and probably several, though Cornish records are not clear on this. It's almost certain that he was overseeing the building of the engine for the Wheal Fortune mine at Ludgvan-Lez in the west of Cornwall. This was the largest Newcomen engine to date, with a 1.19m diameter cylinder. It developed a power output of about 20kW and was pumping the mine by 1719-20. Newcomen was involved directly with at least five, and probably seven, engines in Britain. Many more were built in Britain and in Europe by other engineers, including Marten Triewald, J.E. Fischer Von Erlach (1692-1742) and men from the Calley, Hornblower, Parrott and Potter families. Newcomen's nephew Elias was also an engine builder, though his two sons took different paths — Elias became an ironmonger and Thomas a maker of serge cloth. We know of some 56 engines that were built in the 1720s, with cylinders made of brass or cast iron, and cylinder diameters in the range 610-965mm. They would go on being constructed to the same design long after Newcomen's death in 1729. By the 1730s, most of the cylinders would be cast iron. Fewer were built and the cylinder diameters were smaller than in the previous decade. However, at least 104 engines would be built by 1733, when Savery's extended patent ended. After this, all Newcomen-type engines had cast iron cylinders, and from the mid 1740s their diameters increased to 1.91m enabling a maximum power output of 39kW. 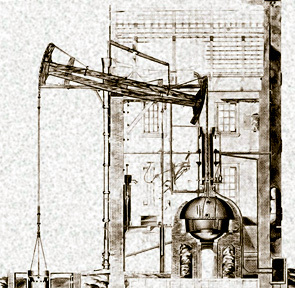 The success of Newcomen's stationary steam engine in pumping water from deep pits is shown by the fact that between 1,500 and 2,000 of them were built in the 18th century. He well deserves to be remembered as Britain's first great mechanical engineer. 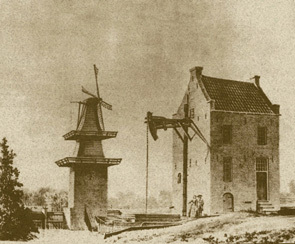 A Newcomen-type engine installed by Rinze Lieuwe Brouwer on the Groenendaal estate of banker Jan Hope at Heemstede, North Holland, in 1780. It was used to maintain water levels in the estate ponds, and was a precurser to the first steam-driven pumping station in the Netherlands (1787, north of Rotterdam), which used a James Watt engine. Brouwer was a member of the Batavian Society of Experimental Philosophy. A drawing by Rinze Lieuwe Brouwer of the Newcomen-style engine on the Groenendaal estate.